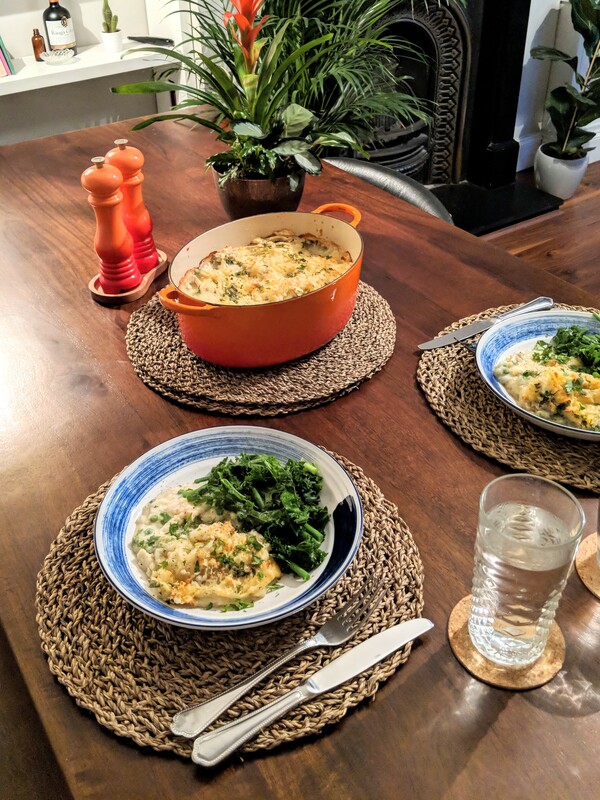 I made this delicious fish pie off the cuff last week, after browsing my Instagram feed and spotting a photo of a fish pie, that a colleague had made at work. 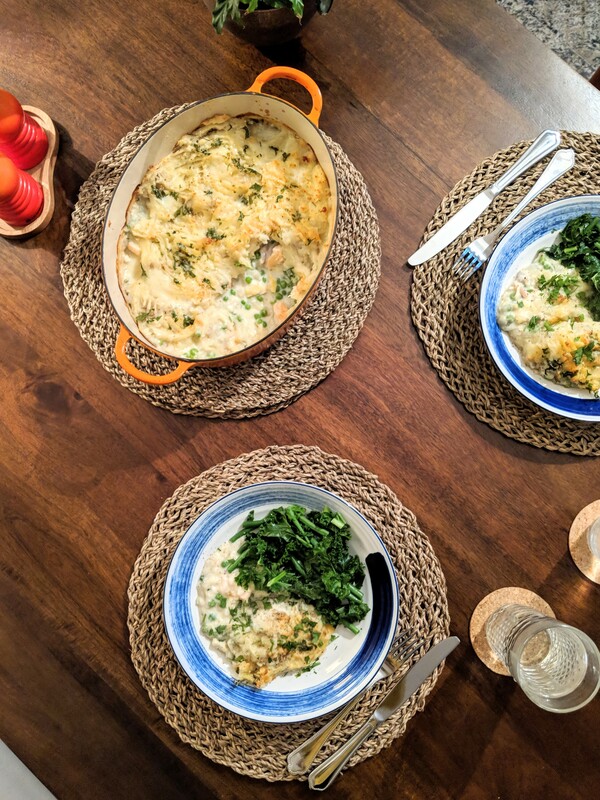 Fish pie happens to be one of Stew’s favourite meals, and yet I’ve never made one before! 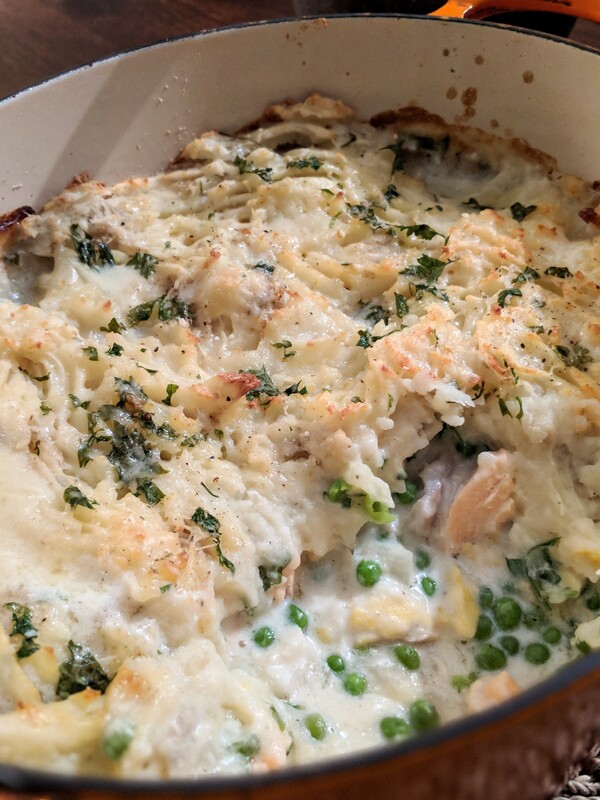 I’ve always thought that a fish pie is a complex recipe, taking hours to create. But actually, I was surprised by the recipes I found. 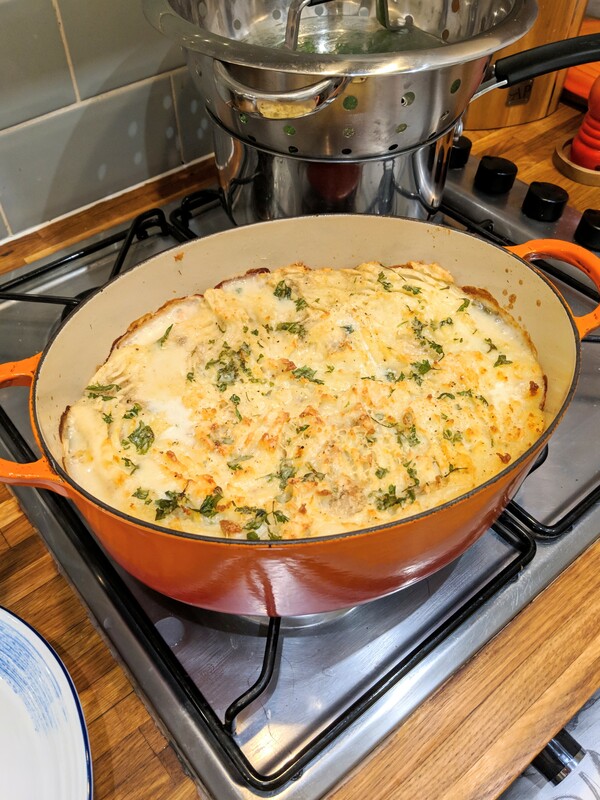 I sort of mashed two recipes together to create my own version of a fish pie. The prep work uses three pans, so a lot of washing up to do afterwards, but other than that, it all comes together fairly easily. This is a great dish for an Autumn evening or lazy Sunday at home. We served ours with some seasonal greens and a dollop of English mustard. 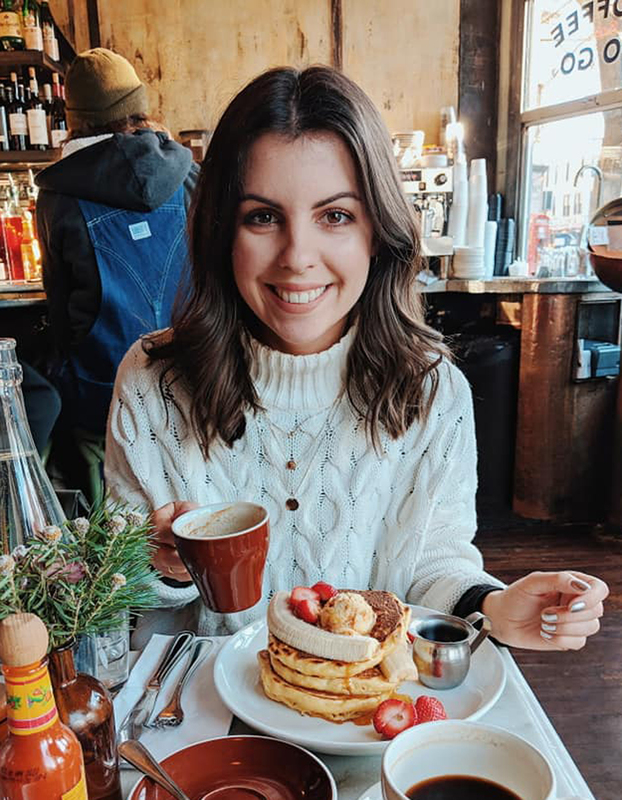 I’d never thought to put mustard with fish before either, but I think because it is topped with creamy, cheesy mash potato, the mustard works perfectly. Preheat the oven to 180 degrees. Add the potatoes to a pan of boiling water and simmer for 20 minutes. In a separate pan, bring the milk to a gentle boil, add the smoked haddock, cod and salmon. Cut the onion in half, push the bay leaf and three cloves into the half and add it to the milk and fish pan. Simmer the fish for 5-6 minutes. Remove the fish from the pan and set to one side. Turn the heat off the milk pan and also set to one side. Dice the remaining half of onion and add it to a third pan with a drop of olive oil and the butter, over a medium heat. Fry with the garlic for a couple of minutes. Add the plain flour and slowly add a little of the milk in at a time. Stir as you add the milk and the mixture should start to form a thicker consistency. Add the fish to the sauce, along with the peas and a handful of chopped parsley. Stir well. Drain the potatoes and add the butter and creme fraiche. Mash until you’re happy with the consistency and season with salt and pepper. Spoon your fish mixture into the bottom of a large oven proof dish. 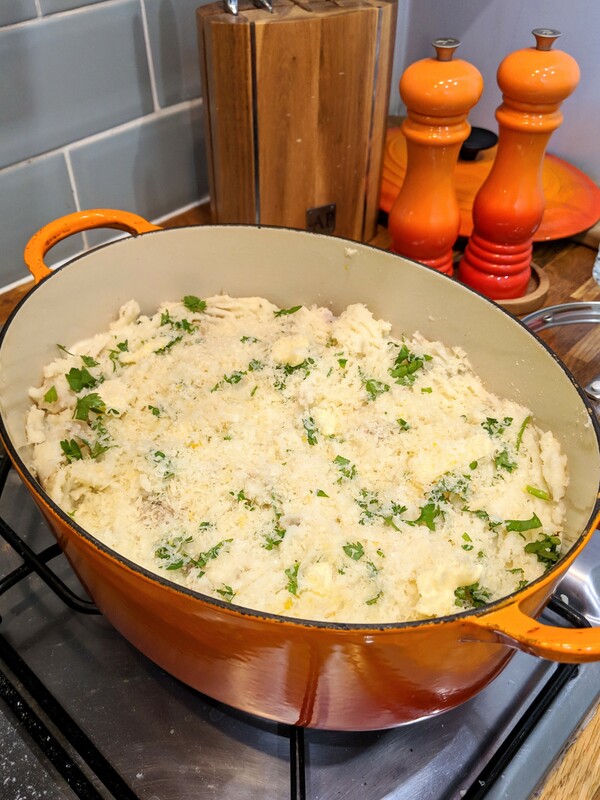 Top with the mashed potatoes and sprinkle with the parmesan and remaining parsley. Finish with the zest of one lemon. Cook for 25-30 minutes until the pie is bubbling and the mash potato has browned slightly. Serve with veggies and a glass of wine!